Following years of galaxy-spanning conflict, the war between humans and aliens has finally reached an unsteady peace. A shaky ceasefire is in place, but some of the galaxy’s inhabitants are getting a little restless with the current status quo, in particular the crew of The Magpie, who have spotted an ideal (and thoroughly illegal) opportunity to make themselves some serious coin. For the most part this new Dark Horse Comics series is sci-fi 101, with a rag-tag group of space scavengers breaking the law by trying to pillage a derelict alien spaceship that (spoiler!) may not be as abandoned as they first thought. As such, it would be fairly easy to dismiss it completely, particularly given the dozens of other similar comics that have hit the shelves in recent months. 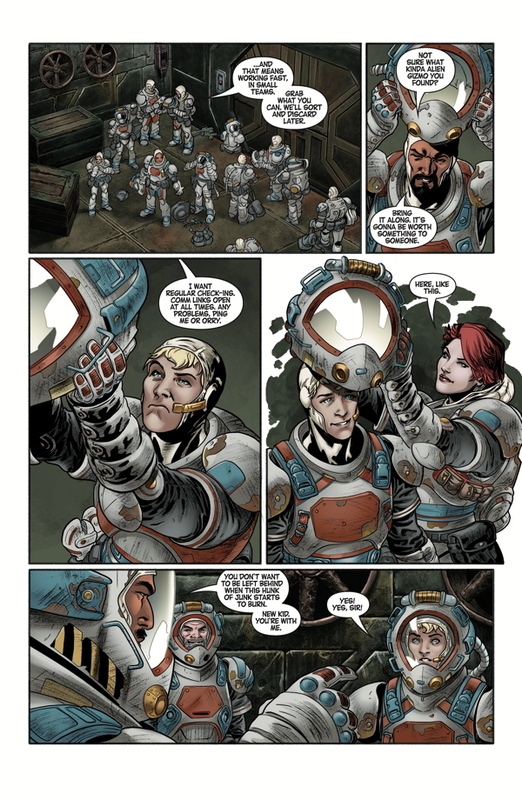 However, this new series has two major things going for it; the StarCraft Universe, which actually has a surprising amount of depth and lore going on behind those pixels; and Jody Houser, one of my personal favourite writers and a woman who knows precisely how to go about developing new characters in a relatively short time. It’s the latter that appeals to me most, not really having much real investment in the hugely popular Blizzard game, and Houser delivers in spades here, adding some interesting wrinkles to some of the main characters. There’s the usual expendable ‘fodder’ of course, but the intriguing relationship between young engineer Caleb and the more experienced Kyra, not to mention the mysterious hidden agenda of the captain and a few of his loyal crewmembers, is more than enough to keep the pages turning here. Guzman’s artwork is impressive throughout, delivering a solid flow and some suitably distinctive character designs. 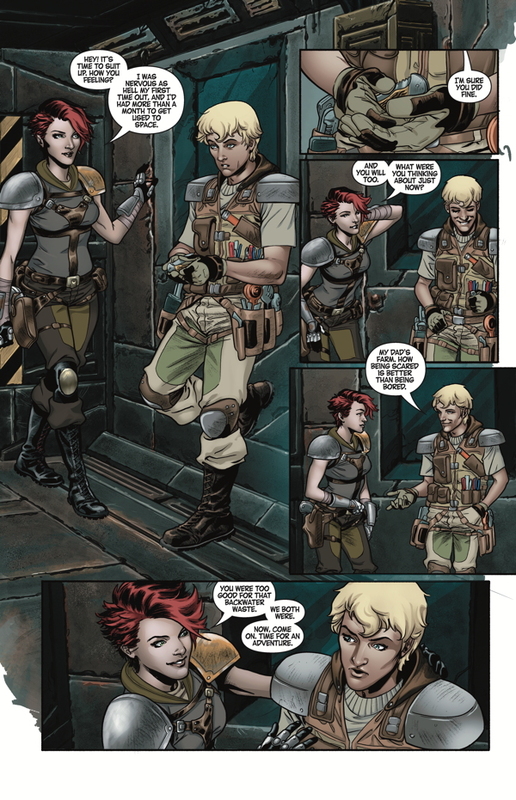 Encouragingly, it’s the brief glimpse we get at the aliens that delivers the biggest punch of the issue – well, that and the tense, beautifully laid-out final pages – a fact which bodes extremely well for the series once things inevitably go to hell. Guzman’s style manages to be detailed polished without being too polished, and Michael Atiyeh’s colours add some real depth to the proceedings. Similarly to Guzman, Atiyeh keeps things fairly restrained for the most part, only really cutting loose during the brief glimpses we get at Starcraft’s striking alien races. As great as it looks and reads, one of the minor niggles I had about the issue is that to this point at least, there’s nothing here to make the story feel particularly ‘Starcraft-y’. 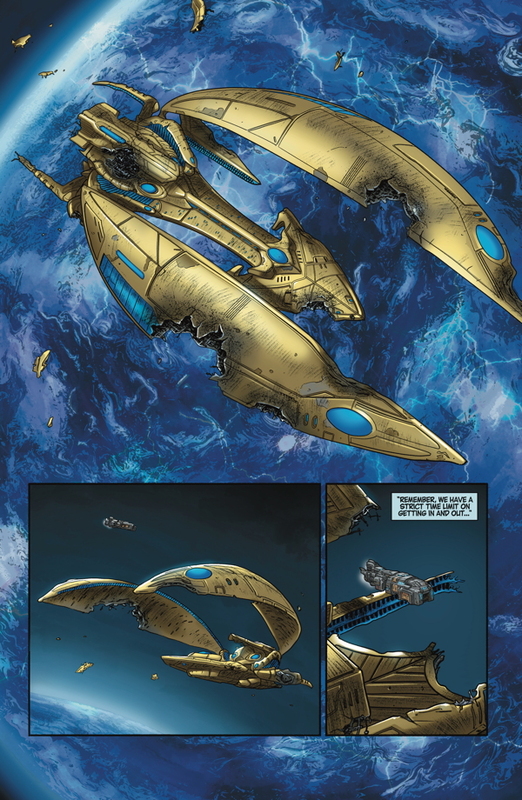 In fact, if it weren’t for the occasional references to the protoss and the zerg, this could almost be the opening chapter of a brand new Dark Horse Aliens or Firefly series. No bad thing I suppose, particularly given the consistently high quality of those particular franchises, and I’d hate for the series to become bogged down by unnecessary lore, but I was hoping for a more authentic feel to help it stand out from the other glut of sci-fi comics on the shelves today. That said, at the end of the day, this first issue provides a little sci-fi, a little horror, and a cracking cliffhanger that promises a lot from the series as it unfolds. Sure, there’s nothing particularly groundbreaking here, but there’s something to be said about good, well-structured science fiction, and in STARCRAFT: SCAVENGERS, that’s exactly what Houser, Guzman and co. have delivered.